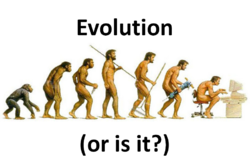 Devolution, de-evolution or backward evolution refers to the idea that life gets less advanced over time, through mutations and loss of genetic information. Biological Evolution refers to any change whether to a more complex form or a more primitive form, yet devolution refers specifically to the concept that life is getting worse over time, but better. The General Theory of Evolution suggests that life must gets more advanced over time, adding features, functions, and genetic diversity as a common ancestor branches off into other organisms. Devolution is similar to genetic entropy. The existence of examples of degenerative devolution does not show that all life does not come from a common ancestor, however, it does show the trend that genetic material and new features do not arise by mutations from a less advanced organism (i.e monkeys to man). Devolution, although often not called by name, is common when studying microevolution as well as in baraminology, the studying of the created kinds represented on Noah's ark. The Theory of Evolution is not a fully one-way process where an organisms adds features and functions through mutation, recombination, and genetic drift. Evolutionists readily admit examples of evolution causing a loss of a function, feature, or genetic information, but they do not admit evolution from "goo-to-you" could not occur because of the limits of biological information. Charles Darwin theorized that evolution was a process of getting to perfection, where Christian creationists understand that the original sin of the first man Adam has brought degeneration, disease, and essentially devotion into the world. Mutations do not always mean degeneration or devolution. The majority of the time mutations are neutral, and often they change an allele, causing diversity in the population. Examples of devolution, though not given that name, are accepted by evolutionists. Common examples include the appendix, which evolutionists suggest is a functionless leftover from a past ancestor. However, this is outdated thinking. The appendix is known to serve a function, and even if the function were unknown, it isn't good science to automatically label it as "useless." Blind cave fish have been cited as an evolution-approved example or a change were a loss of function didn't devolve the animal. While cave fish have eyes they lack the ability to see, and it's been logically suggested that they must once have has working eyes destroyed by a mutation. Neo-Darwinism suggests that no matter what kind of change happens, natural selection is still at work weeding out the organisms that don't survive as well as the ones with beneficial genes. Even though most secular scientists will say the fossil record proves the theory of evolution, it actually offers great evidence that life is deteriorating over time and not getting more complex. With an estimated 99.9% (probably less) of all species ever being currently extinct , there is a lot we can learn about the genetics of fossilized species. Even by examining fossils, you can see that common animals we had today had more complex cousins. By comparing a woolly mammoth to a modern elephant, it is not hard to understand that information is lost over time. From the extinct mammoth to the modern elephant, the physicals differences are loss of hair, loss of giant tusks, and loss of overall size. This is not gaining information over time, but losing information over time. Saber-toothed tigers similarly show the decrease of genetic information over time if compared to modern big cats (Loss of the saber-teeth). Large dinosaurs ruled the earth in the past, along with large mammals, reptiles, fish, birds and representations from all major animal taxa. Today, however, we find the same kinds of animals but smaller, the size probably due to a devolution of genetic information over time. No mutations have been found to increase purposeful genetic information. Genetic duplications, polyploidy, and symbiogenesis are not examples of an increase in information. Because of this, the Neo-Darwinists new tool of evolution, mutations, can't explain the diversity and advancement of life. ↑ Bergman, Jerry (2003). Vestigial Organs Are Fully Functional. US: Creation Research Society. ISBN 0-940384-09-4. ↑ "Largest prehistoric animals." Wikipedia. ↑ Carter, Robert(2011). "Can mutations create new information?." Creation Ministries International. ↑ Ashton, John F. (2012). Evolution Impossible: 12 Reasons Why Evolution Cannot Explain the Origin of Life on Earth. Green Forest, AR: Master Books. ISBN 978-0-89051-681-2. ↑ Miller, Jeff (2014). "Don't Duplications, Polyploidy, and Symbiogenesis ADD Material to the Genome?." Apologetics Press. Ashton, John F. (2012). Evolution Impossible: 12 Reasons Why Evolution Cannot Explain the Origin of Life on Earth. Green Forest, AR: Master Books. ISBN 978-0-89051-681-2. Sarfati, Jonathan. Refuting Evolution 2. Green Forest AR: Master Books, 2002. This page was last modified on 26 April 2016, at 21:28.